The Library received cultural clearance from the Umbakumba Community Council Inc, Groote Eylandt, to display this image. Reproduction rights are owned by State Library of South Australia. This image may be printed or saved for personal research or study. Use for any other purpose requires permission from the State Library of South Australia and the Umbakumba Community Council Inc.
To request approval, complete the Permission to publish form. 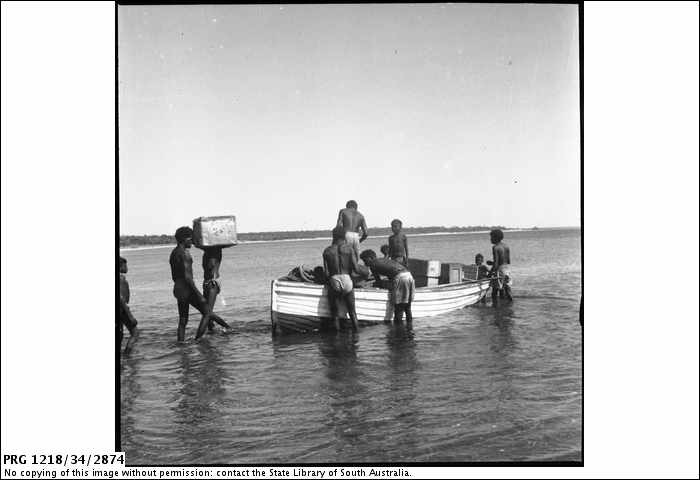 Unloading expedition supplies brought in from the stranded barge 'The Phoenix', off Groote Eylandt, during the 1948 American- Australian Scientific Expedition to Arnhem Land.